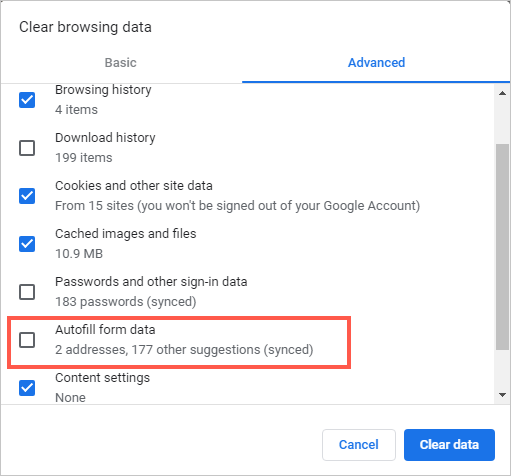 Google Chrome stores your browsing information such as login details, search phrases, passwords, visited sites and other previously typed text. Chrome then uses this history to predict and provide suggestions next time you visit the same pages. When you start typing in the address bar or site forms, the browser will compile a list of suggestions (names, search terms or addresses) based on your browsing history. While Chrome autofill and URL predictions can improve your browsing speed, at times they can be distracting and annoying. Besides, if you share a computer, other users can access this data, leaving your private information vulnerable to security threats. Fortunately, you can disable the autofill and predictions in Chrome to prevent distractions and keep your browsing history safe. 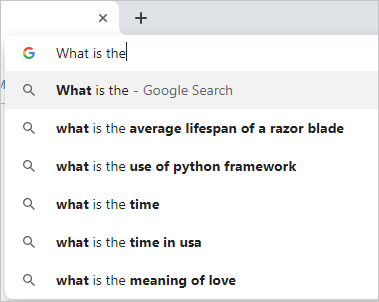 How to Disable Chrome Autofill and Predictions? This article teaches you how to delete and disable Chrome AutoFill suggestions in the following ways. Related: How to open Chrome with incognito mode by default? Open Chrome on your computer, click the menu icon at the top-right corner of the browser and select settings from the drop-down menu. Scroll to the bottom of the settings page and click the “Advanced” arrow to go to advanced settings. Go to the “Privacy and Security” section and toggle off the switch under the heading, “Use a prediction service to help complete …” Turning off the option will grey out the blue switch. Scroll down the section and switch off the “Use a prediction service to load pages …”. If you are filling a form on a site, Chrome will save your details such as name and address, login credentials and other personal information. Next time you visit the site or pages with a similar form, the browser will autocomplete the fields from the saved data. 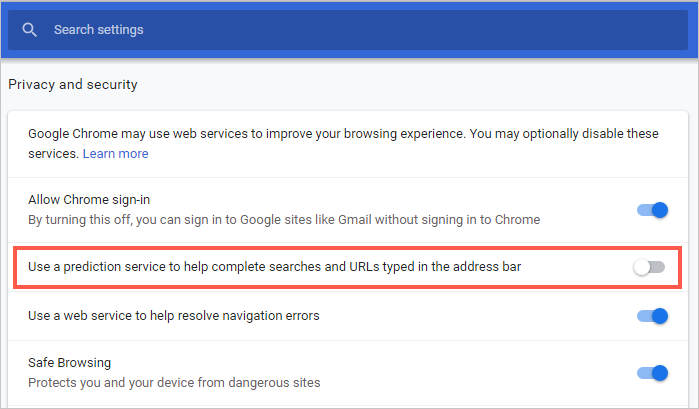 In order to deactivate the autofill tool in Chrome, navigate to the Chrome customization menu and then to the “Settings” page. Scroll down to the “Autofill” section (second category on the settings page) to find the autofill option. You can see three sections – passwords, payment methods and addresses and more. Click the arrow against each section to expand the option. Under passwords, you can toggle off the “Auto Sign-in” switch to remove sign-in autofill entries. You may turn off the “Offer to save passwords” option to stop Chrome from prompting you to save passwords. To remove previously saved passwords, look for the specific site and username and click the three dots on the right edge of the entry. Select “Remove” to delete the data. Note that, you will have to enter the sign-in credential each time you visit the site. Turn off the “Save and fill addresses” option. Repeat the same process to disable autofill for your payment methods. Note: Even after you deactivate the Chrome autofill and predictions, you will still get suggestions when you type a search term or URL. 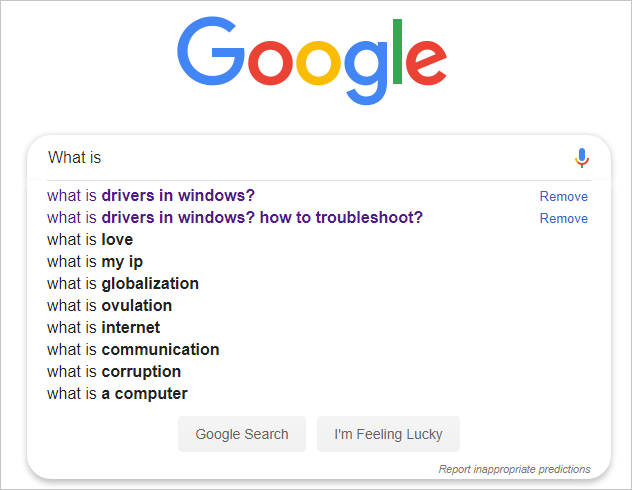 To remove these suggestions, you need to clear the browser data to completely delete the saved autofill, cookies and history. 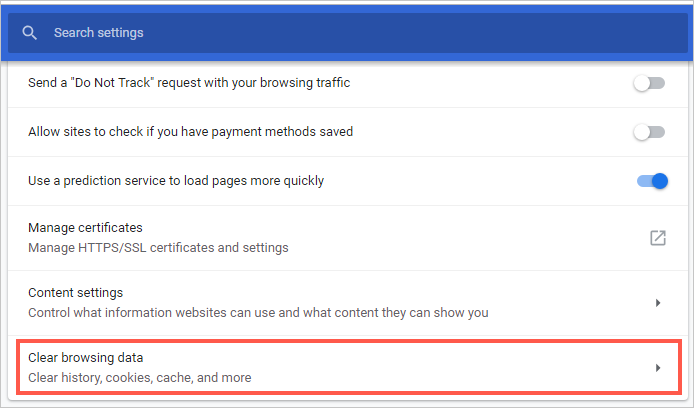 At the bottom of the “Privacy and Security” settings segment, click the “Clear browsing data” option. Alternatively press “Ctrl + Shift + Delete” keys on Windows and “Command + Shift + Delete” on Mac. Go to the “Advanced” tab and check the appropriate fields (autofill form data, history and cookies). Click the “Clear data” button and wait as chrome removes all the saved data. You can also remove a specific suggestion from the list of Chrome predictions. Type your search term or URL in Google address bar or search box. For some suggestions, you can use the “Remove” button at the end of the option. Alternatively, hover the mouse over the prediction you would like to remove and then press “Shift + Delete” on your keyboard. Related: How block ads in Google Chrome? As a modern browser, Chrome has in-built prediction and autofill services, which handle browsing data to autocomplete forms and offer search suggestions. This can increase your browsing speed and convenience making you more productive. However, this benefit can compromise your data security as attackers can use malicious scripts to reveal your personal data. Furthermore, the Chrome autofill and URL search suggestion may be incorrect and irrelevant. Deactivating the autofill and prediction service can be helpful, especially if you use a shared computer. This will ensure other users cannot access your private information. Whether for security purposes or you want to minimize distractions, you can follow the above steps to disable autofill and predictions in Chrome.